[prMac.com] Seoul, Korea - Publisher DK (London,UK) and developer Y Factory (Seoul, Korea) are proud to today announce the release of Show Me The Money, Part 1 - The Story Of Money, Version 1.0 for the iPad and iPhone. 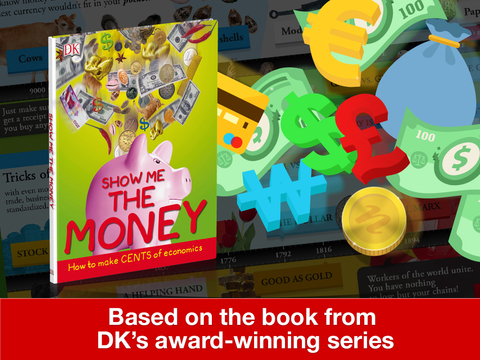 The app is based on the popular book that teaches children about the fascinating and multifaceted subject of money. Via entertaining graphics, animation, sound and narration, Show Me The Money teaches youngsters what money is, how it works, what it means to them, and how to spend and save it wisely. Show Me The Money app offers kids an entertaining, yet educational and informative look at the subject of money, and how it has changed throughout history. The app teaches users how money came to be, why it has the value it does, how banknotes are protected against forgery, how the credit card was born, and much more. "A recent report from The Institute for Public Policy Research revealed that children in the United States who had received the proper financial education in school were around $60,000 richer by the time they reached the age of 40," says Y Factory CEO Ryan Kim. "Educating our children about money, its uses, and the proper way to spend and save it can lead to better financial security for those children in their later lives." Show Me The Money begins by explaining how people bartered for goods before the invention of money. A need for a valuing system led to the invention of currency, and how it was used at the beginning, in a manner similar to the way monetary value is still set today. Also included is a handy timeline that shows the history of money. Users can drag their finger along the timeline and tap various points in history to learn more about the evolution of currency. The app continues to teach the user about how money is made - and protected - by using modern techniques of watermarking, special materials, and serial numbers, as well as other methods of protection, both visible, and invisible to the naked eye. Also included is an entertaining section on why credit cards were invented, and how they work. The app continues with valuable lessons on how the stock market works, finishing up with a section on modern-day cashless bartering systems. In order to demonstrate the lessons they've learned by interacting with Show Me The Money, kids can take an fun, yet challenging quiz about money, allowing them to collect a number of ancient coins from various civilizations from around the world. For every question a child answers correctly, they receive a coin. If the child answers incorrectly, they will have the opportunity to answer the question later on. Once a child collects all the coins by answering all of the questions correctly, they can then view their coin collection. DK is a publisher of books, eBooks and apps in more than 100 countries and 60 languages. Founded in London in 1974, DK is a leading illustrated reference publisher for children and adults. DK is part of the Penguin Group that, as of the 1st of July 2013, officially united with Random House to create Penguin Random House, the world's first truly global trade book publisher. Show Me The Money, Part 1 - The Story Of Money, Version 1.0 is $3.99 USD (or equivalent amount in other currencies) and is available worldwide exclusively through the App Store in the Education category. Review codes are available upon request. Y Factory tries their best to bring out content's true meaning and value through quality applications for children. With optimized content experience, they provide children pleasure of new discoveries and learning on their own. With this approach, Y Factory connects children and parents, culture and technology, and digital and hearts. Copyright (C) 2015 Y Factory. All Rights Reserved. Apple, the Apple logo, iPhone and iPod are registered trademarks of Apple Inc. in the U.S. and/or other countries.